I love lists and especially gratitude and success lists. Each year, I track which paintings sold so I can express my appreciation to the universe for bringing me awesome collectors like you. For example, this sunflower was collected by one of my art students. She herself is learning how to paint and finds inspiration being surrounded by art that she loves. You can discover a sunflower painting on my website. I think I only have one original painting in the studio, but there are sunflower prints and more on the way. If you want to surround yourself with art, you can also own the luxury of a fine art original. However, you can collect prints of any of the artwork you see here. If you can't find it on my website, please just respond to this email. I would love to create a custom print or even a special commission just for you. In 2017, I sold 19 originals and also completed 7 commissions of pets, homes and people. In this blog post, you can explore some of my favorite originals. Animal art continues to be a best selling subject for me as 12 of the paintings collected last year were either dog portraits or original animal art. Want prints of any of the artworks you see here? If you can't find it on my website, write me an email: Miriam@Schulmanart.com. I would love to create a custom print or even a special commission just for you. 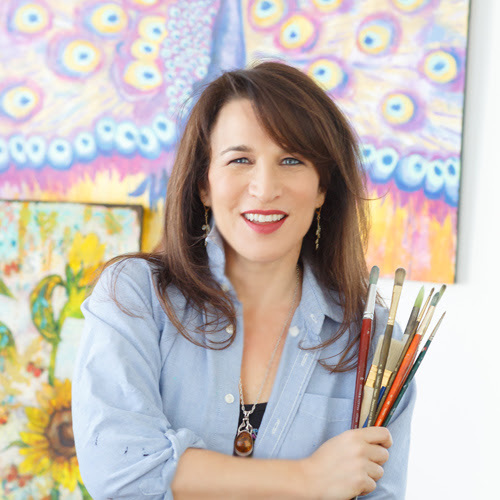 Hey there, I'm Miriam Schulman and I tell stories (often with watercolor and mixed media) I also teach other people how to express their stories through art. When I'm not working in my art studio, you can find me in museums, spending time with my amazing family -like screaming my head off at my son's wrestling match or watching my daughter play cello.